Is it the collections that are rubbish? Some people saw the move towards increased recycling but fortnight “black bin” refuse collections as a reduction in service. As I argued at the time it was introduced, anything that supports recycling is to be encouraged. I like my new recycling bin, although anecdotally take-up still needs enhanced education and information to residents – including doorstep visits and information in translation. However, disenchantment could easily set in if when a fortnightly collection is not fortnightly, and weekly recycling is not weekly. Veolia’s problems with snow last month were hard for many in South Tottenham to understand: while the west of the borough was afflicted, roads here were clear all week. With a light dusting of snow on a Sunday, why were our collections the following Thursday cancelled? The lack of communication did not help. UPDATE Saturday 23 February: After appearance of this blog and emailing Haringey Veolia contract manager… the collection was carried out! Is this a one off or widespread? Now we’ve had the new collection arrangements in place for a few months, what is your experience? Are they working? Are Veolia providing a good or bad service? 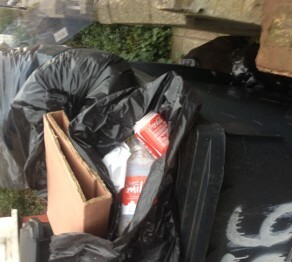 This entry was posted in Living in and tagged Haringey Council, Rubbish collection, South Tottenham, Veolia on February 23, 2013 by admin. Unfortunately, the refuse and recycling service, which was often sporadic at best and non-existent at worst, has been getting worse. Critics are right in that the introduction of fortnightly collections mean a reduction in service. How can an inner-city council like Haringey able to get away with it? Because, typically, we in Tottenham allow them to.